Courtney Conlogue (USA) with the coveted Bell, the winner’s trophy that will have her name added to it for the second year in a row after she took out the 2017 Rip Curl Women’s Pro Bells Beach today. BELLS BEACH, Victoria/AUS (Monday, April 17, 2017) – Courtney Conlogue (USA) has won the Rip Curl Women’s Pro Bells Beach today after defeating Stephanie Gilmore (AUS) in four-to-six foot (1 – 2 metre) conditions at the world-renowned Bells Beach in the Australian state of Victoria. 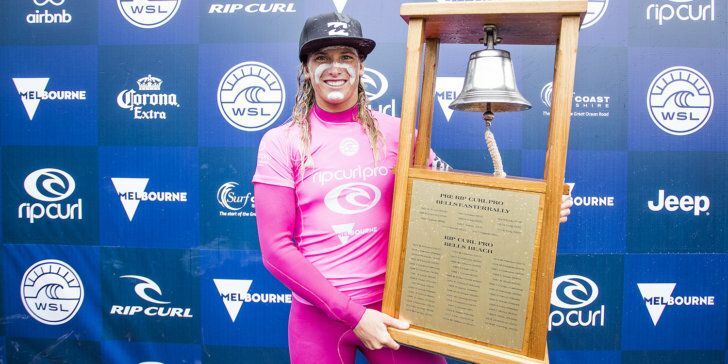 The third stop of the World Surf League (WSL) Championship Tour (CT), the Rip Curl Women’s Pro Bells Beach, witnessed Conlogue ring the coveted Bell for the second time after her dominance throughout the final series today. The Californian unleashed her aggressive power-surfing to take down a stacked field of competitors, including six-time WSL Champion Gilmore, reigning WSL Champion Tyler Wright (AUS) and three-time WSL Champion Carissa Moore (HAW). Courtney Conlogue (USA) moves up the Jeep Rankings into the fourth spot with her win at Bells Beach today. Conlogue came into the start of the 2017 season as World No. 2, but a 9th place finish at the Roxy Pro Gold Coast and 5th place result at the Drug Aware Margaret River Pro set her back to World No. 9. The Californian’s win today moves her up to fourth on the Jeep Leaderboard to now put her World Title campaign back on track. The Final saw an exciting battle between Gilmore and Conlogue. Gilmore got the edge on the opening exchange with an excellent 8.33 (out of a possible 10) to Conlogue’s 8.00. The women continued to charge, again posting excellent-range scores with Gilmore leading Conlogue’s 15.27 combined score by only 1.06 points. In the last 5 minutes of the heat, Conlogue took off on the biggest set wave of the Final and displayed her trademark power hacks and jams in the pocket to post an excellent 9.00-point ride for the lead. With only seconds left, Gilmore attempted to scratch into a medium-sized set but was unable to make it, leaving Conlogue to win her second consecutive Bell with a heat total of 17.00. Coming into the Final, Gilmore was looking to add a fourth Bell to her trophy cabinet to equal the great Lisa Andersen (USA) for Rip Curl Pro Bells Beach titles. After a series of buzzer-beater heat wins throughout the Australian leg, Gilmore seemed to shift gears and stay more active in the Final, which gave her the upper-hand for its majority. Although Gilmore wasn’t able to get the win on her 11th time competing at this event, she heads to Brazil as the Jeep Frontrunner. Six-time WSL Champion Stephanie Gilmore (AUS) came just short of clinching her fourth Rip Curl Pro Bells Beach title today but holds onto top spot on the Jeep Leaderboard. The first Semifinal saw Conlogue blast two near-perfect 9-point rides for the win over 2016 WSL Champion Wright. Wright, with a 7.17 and 7.83, was not able to overcome the Californian and will be eliminated in Equal 3rd place. Wright has made the final series at each of the events on the Australian leg, including a runner-up finish at Margaret River and 5th place on the Gold Coast. Today’s result will see Wright stay in 3rd on the Jeep Leaderboard. Reigning WSL Champion Tyler Wright (AUS) put on an incredible display at Bells Beach and will exit with a 3rd place result. Eventual winner Conlogue previously dispatched three-time WSL Champion and three-time event winner Moore in the opening Quarterfinal matchup. A heated battle saw the two post excellent range scores. An intense paddle battle gave way for Conlogue to regain priority at the halfway mark. With ten minutes left and needing an 8.24, Moore waited for a set to come through while Conlogue kept busy on the inside. Moore missed her opportunity at the five minute mark to put even more pressure on her final attempt. Moore chased down a wave in the final minute, but it was not enough to meet the requirement. Moore will be eliminated with her third 5th place result of the season. Californian Lakey Peterson (AUS) was not able to hold on in the second Semifinal against Gilmore. Peterson’s 3rd place result matches her best finish at Bells in 2013. In addition to her finish in Victoria, Peterson’s runner-up result on the Gold Coast and 13th in Margaret River will put her at 5th on the rankings heading into the next event. Lakey Peterson (USA) moves two spots up the Jeep Rankings to fifth after her Equal 3rd finish at the Rip Curl Women’s Pro Bells Beach. Sally Fitzgibbons (AUS), 2017 World Title contender and two-time event winner, was eliminated in the Quarterfinals by Peterson. In a tight matchup, Peterson got the edge over Fitzgibbons by a narrow margin of 0.26 points. Fitzgibbons was leading the Jeep Leaderboard coming into this event, but now moves to 2nd with this result. The day kicked off with the remaining five heats of men’s Round 3 and saw Filipe Toledo (BRA) rip into the Bells Bowl with a near-perfect 9.77 and 8.50 to jumpstart the day. Adrian Buchan (AUS) was not able to combat the Brazilian charger and will leave with a 13th place result. In a major upset, defending event winner Matt Wilkinson (AUS) was knocked out by Wiggolly Dantas (BRA) in Heat 10 of Round 3. Dantas took advantage of the conditions to get vertical on his backhand maneuvers and earn a 13.73 combined score. Wilkinson fought tooth and nail for the lead but couldn’t quite find the required score at the end. 2015 WSL Champion Adriano de Souza (BRA) and 2012 WSL Champion Joel Parkinson (AUS) made their way through to the next round after taking down Jeremy Flores (FRA) and CT Rookie Connor O’Leary (AUS), respectively. Three-time event winner Parkinson showcased textbook turns to earn his way through with an excellent 8.33 and 7.33 to make up his two-wave score. Jordy Smith (ZAF) also found success today in Round 3 with a win against Joan Duru (FRA). Smith landed a near-perfect 9.27 and excellent 8.83 to dispatch the CT rookie. Although Duru was beaten, his performance throughout this event was spirited as he displayed his critical backhand attack. Smith will now move into Round 4. Event organizers will reconvene tomorrow at 6:45 a.m. local time to reassess the conditions and make the next call. SW swell continues Monday, slowly easing, fading further into Tuesday morning. A solid swell will peak Wednesday and fade Thursday, although wind will not be as favorable as what we’ll see the next couple days. A final swell is possible for the end of the waiting period, although it looks smaller than what we’re now.